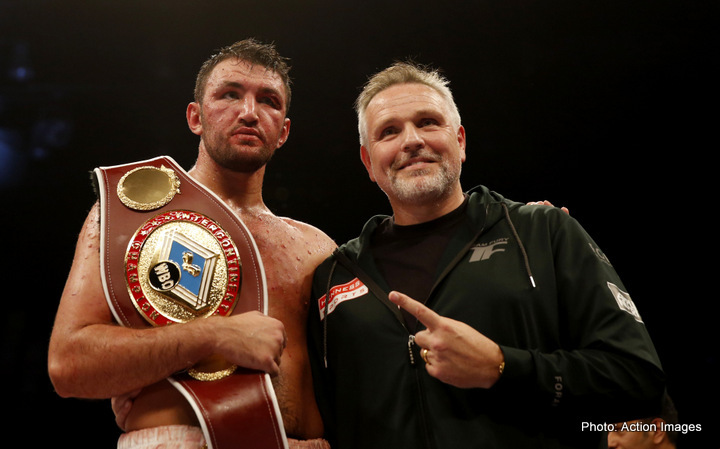 Peter Fury has warned the heavyweight division son Hughie Fury is developing the power to complement his undoubted technical skills. Fury (20-1-KO10) was controversially denied a world title by a majority decision defeat to Joseph Parker in September 2017 and will challenge Sam Sexton for the British crown in Bolton on Saturday. With his natural talent clear for all to see, father and trainer Peter Fury is encouraged by the increasing weight in the punches thrown by his son, who is still just 23 years of age. Peter Fury said: “It’s fair to say his power has grown. He’s holding a lot more in his hands these days. It’ll be nice to some improvements when he gets in there on Saturday. “If these fights become available, we’ll always take them. Safe to say, he’d fight for a world title tomorrow if it was available. The 25-year-old Scouser makes his professional debut on the Sam Sexton-Hughie Fury undercard at the Macron Stadium, Premier Suite, in Bolton on Saturday 12th May. Sexton v Fury is exclusively live on Channel 5 from 9pm, with live coverage of the undercard on 5Spike starting at 7.30pm. He’s targeting lightweight titles after teaming up with Kieran Farrell and said: “My style is similar to (ex-WBO super-welterweight champion) Liam ‘Beefy’ Smith. Dring is a product of Gemini Amateur Boxing Club. He had around 50 bouts for them, mainly as a schoolboy and junior, and reached a Golden Gloves final in 2007, losing to Charlie Edwards. Dring was also outpointed by Edwards in a box off for the European Schoolboy championship. “I fought a lot of good lads in the amateurs,” said Dring. “Lads who are doing well in the pros now like Ryan Wheeler and Jordan Cooke. “I had a couple of years off and now I’m back. “I’ve been boxing since I was nine years old and I got a bit stale – and a bit fed up of getting robbed all the time. “I haven’t boxed for two-and-a-half years, but I never fell out of love with boxing. “I was always around the gyms, always watching fights and when one of my pals started training with the pros, I went along with him and got my hunger back. “The break has done me good. I felt refreshed. “I decided that rather go back to the amateurs and get ripped off, I would make a big comeback in the pros. Dring features on an action packed card headlined by Sexton v Fury for the British Heavyweight Championship; exciting Leeds talent Reece Cartwright defends his IBF Youth World Middleweight Championship (TBC); Galway’s ‘Connemara Kid’ Peter McDonagh competes in a 10-round international super-featherweight contest and female boxing sensation Savannah Marshall, double Olympian and 2012 World Amateur Champion, makes her UK debut in an 8-round middleweight contest, and unbeaten super-featherweight prospect Yusuf Safa. Previous boxing news: 13 years on – is the Corrales-Castillo war still THE greatest fight ever?